Our Rock Hill Ranch Organic Extra Virgin Olive Oil is available in our "food service for the home chef" size. For those who want more product, less packaging, all for a better value...here it is in our half-gallon size. 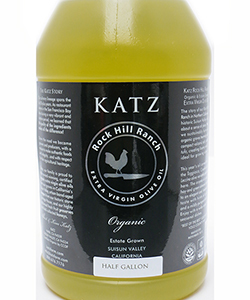 The olives for our KATZ Rock Hill Ranch Organic Extra Virgin Olive Oil are organically grown in the Suisun Valley, bordered on its northwestern flank by the Napa Valley. Hand harvested and bottled unfiltered, the oil has an expansive nose of artichoke, almonds and herbs with a lush mouth feel and a pleasant and pungent finish.